Slippers for toddlers help keep our little people’s feet warm and cozy, and can be one of the most essential, well used pieces of your toddler’s wardrobe in the winter time. Not any slipper is suitable for a toddler, though; it’s important that any house shoes your toddler wears for extended periods of time are non-constrictive, soft, and allows your toddler’s feet to fully relax while he’s wearing them. Your toddler’s feet are still growing and developing, and while structured shoes are okay for outdoor play, he should have the utmost flexibility in slippers worn indoors. You also want slippers that are easy enough to put on your toddler can do it by him or herself; your child is learning independence, and putting houseshoes on independently, without being reminded, when he or she comes out of bed can be a big milestone on this route. If they fall off easily, though, they will only be a nuisance, so look for shoes that are both easy to put on and will also stay on until purposefully pulled off. One nice line of slippers that fits this criteria is the BePe Baby Toddler and Little Kids No Slip House Slipper Shoes, a fleece slipper with a non slip sole that is available in both boy and girl oriented designs. (Of course, if your little girl would like camouflage slippers and your boy would prefer a sweet pea design, there’s no reason not to oblige them!) The sole is lightly cushioned, and the fleece soft as anything. Your child should be able to put these slippers on and take them off herself, and will love wearing them all about the house. No more slipping on those wood or tiled floors! If your child needs slippers to wear on less-then-clean floors you may want a thin rubber bottom that can be wiped off when necessary. One good quality slipper with a bit more structure and that easy-clean, no wetness-through rubber sole is the ACORN Kids Colby Gore Moc Slipper. These slippers for toddlers are warm and well-made. The elastic goring on the sides mean that they are easy to slip on and, when on, stay on, and the rubber sole is nicely cushioned with memory foam. Style choices include Black Berber, Orchid, Brown Check and Lupine. Or do you want your toddler walking on one of the warmest, best insulating of all natural fibers—woolen felt? 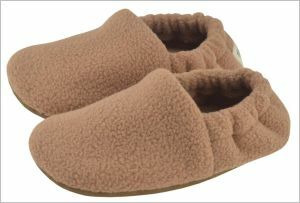 Then Kamik Cozy Cabin Slippers for toddlers may be what you want. Both the upper and lower part of these warm slippers are thick, high quality wool felt, and there’s a ruff of faux fur around the ankle for extra cosiness. The one downside with these slippers is that they have a tendency to skid: there is a little slip protection in the form of a logo printed on the felt sole, but that is all, and that may not be sufficient if you have hard-wood floors or tile. If slipping seems to be a problem, you will either want to choose another brand of slippers or add your own non-skid iron-ons to the sole. Three different slippers, three different ways to keep your child’s feet comfortable. Which is your favorite?